Description LE trim. FUEL EFFICIENT 33 MPG Hwy/24 MPG City! Motor Trend Car of the Year, iPod/MP3 Input, CD Player, Aluminum Wheels, EXTRAMILE 16" ALUMINUM WHEEL UPGRADE.. XM SATELLITE RADIO. 5 Star Driver Front Crash Rating. CLICK NOW! iPod/MP3 Input, CD Player. MP3 Player, Remote Trunk Release, Keyless Entry, Steering Wheel Controls, Bucket Seats. EXTRAMILE 16" ALUMINUM WHEEL UPGRADE PKG wheel locks, road hazard tire warranty, XM SATELLITE RADIO. 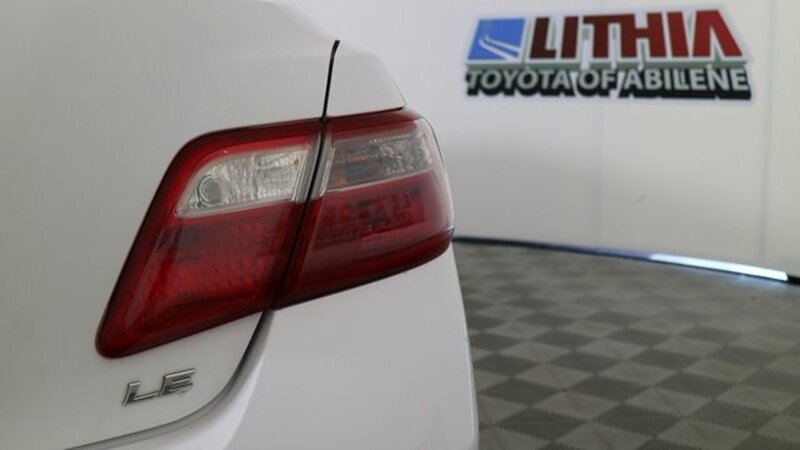 Toyota LE with SUPER WHITE exterior and BISQUE interior features a 4 Cylinder Engine with 158 HP at 6000 RPM*. Motor Trend Car of the Year. MotorTrend.com's review says "In tune with the needs of midsize car buyers, the Camry provides excellent fuel economy, offers responsive handling while providing the smooth, quiet ride that sets a benchmark for the segment.". 5 Star Driver Front Crash Rating. 5 Star Driver Side Crash Rating. Great Gas Mileage: 33 MPG Hwy.